In a heatproof bowl, placed over a pan of warm water, whisk both egg white and sugar. 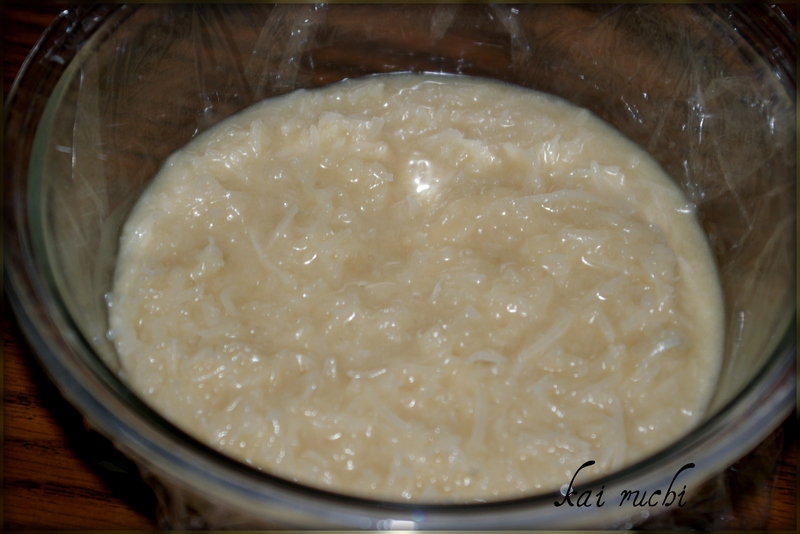 Remove from heat when the mixture is warm to touch and creamy. Add in salt, vanilla essence, sifted all purpose flour and sweetened shredded coconut and mix well. 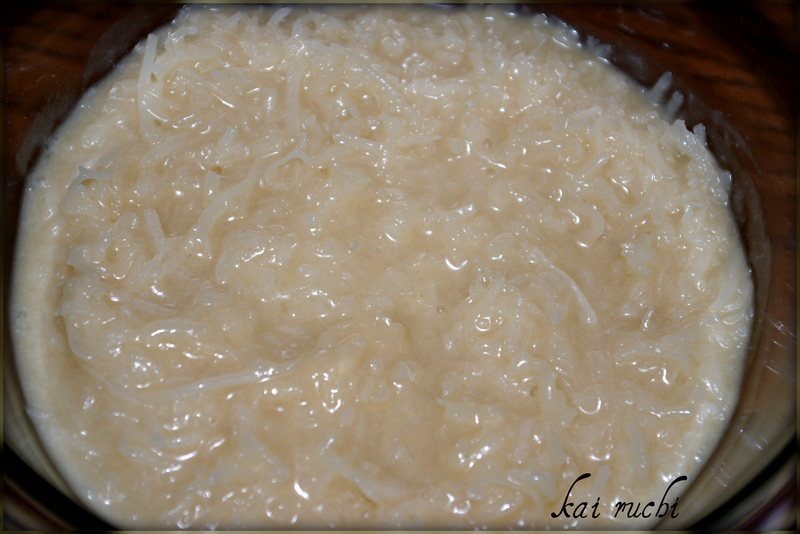 Cover this mixture and refrigerate for 2-3 hours. On a baking sheet, add a parchment paper or aluminium foil and place a scoop of mixture leaving spaces in between. Bake for 15-20 minutes at 350°F or until it turns golden brown. Allow the cookies to completely cool down. (We can have these by themselves or coat them with chocolate). 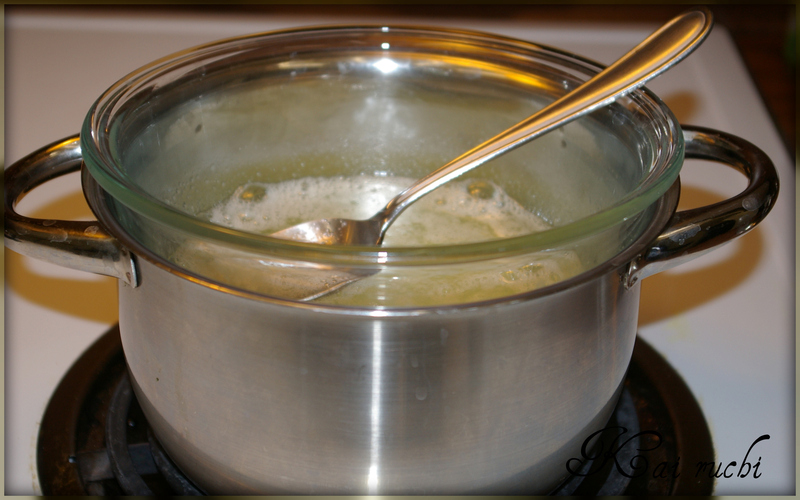 In a small bowl, add heavy cream and heat until it comes to a boil. Now add chocolate pieces or chips and allow it to settle for 2-3 minutes. Mix them evenly, dip the bottom of the cookies and on top, decorate the cookies as per your wish. Allow it to completely dry before you put them into a air tight container. 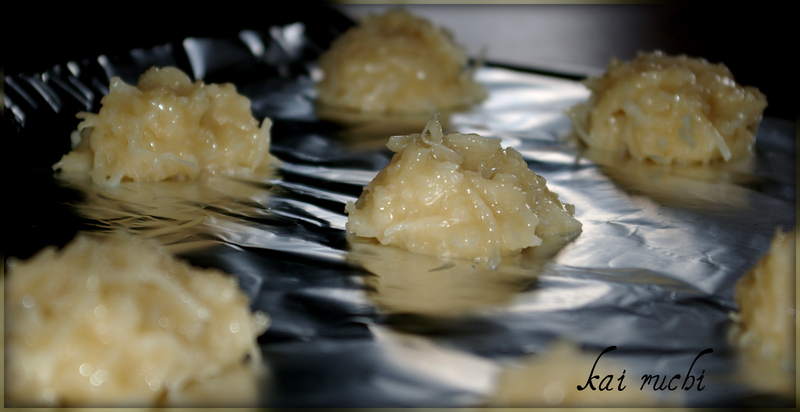 What perfect drizzles on your coconut cookies! That looks so tempting, especially the first click. The chocolate pattern on top is very pretty. 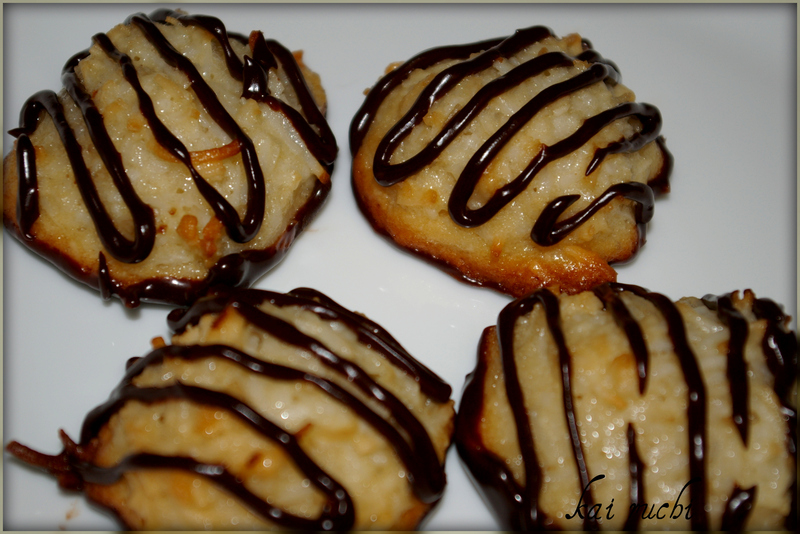 love coconut macaroons,this one with chocolate sauce is yummilicious!! Oh wow, oh wow – this looks soo good! The chocolate was a very clever addition. 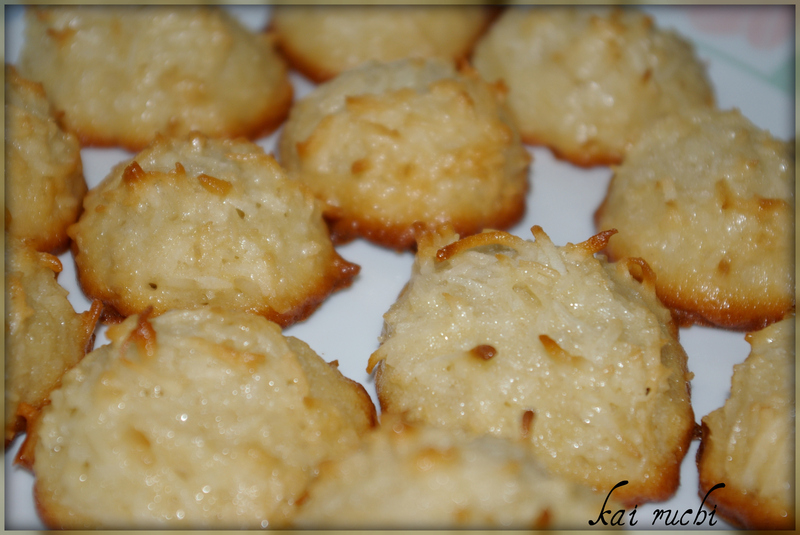 Makes a great coconut macaroon even nicer – takes it to another level of yummy! macaroons just love it……urs looking great and lovely presentation. Very very nice! Love the recipe. Mouthwatering and looks heavenly! Yummu yummy! Love the coconut chocolate combination. The moment i saw this recipe, i went to the kitchen and baked some! We all just loved it and it turned out very nicely. 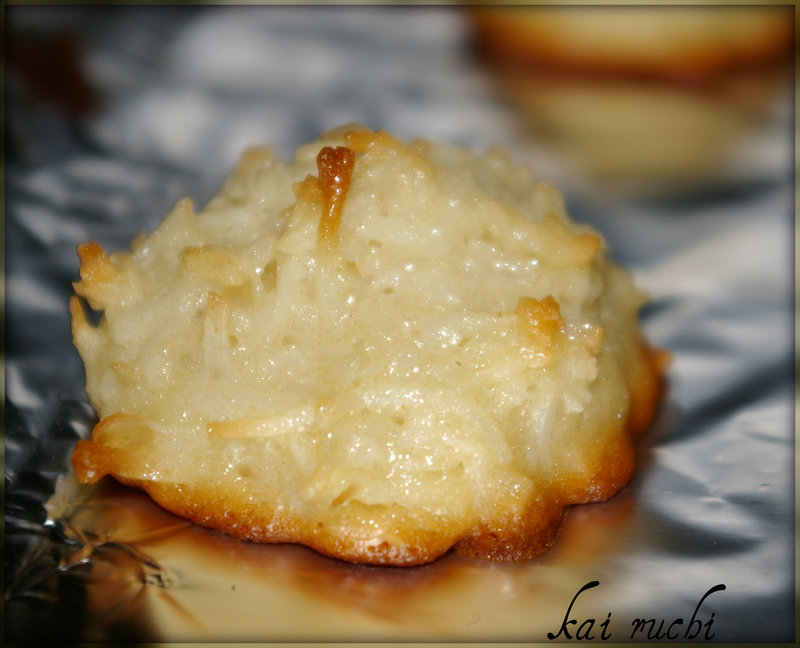 Oh, I love macaroons….this chewy coconut cookie is one of my favorites! And your chocolate addition makes them even better…yum! A winning combination! And they look professionally made! Oh! these look so decadent! 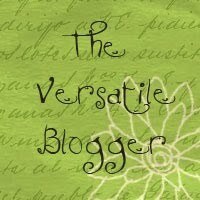 I absolutely adore coconut macaroons and chocolate definitely ups the ante several notches. Delicious post. I love using Coconut and drizle chocolate sound delicious on it !! LoOks absolutely delicious! Love the chocolate drizzle on the cookies…. Very well made and perfectly clicked too. Yummy cookies looks so cute n perfectly made. Mouthwatering cookies! Love the photography and presentation. Very well presented.. The chocolate dipping looks completely awesome! Wow looks fantabulous, very tempting, feel like making it right away! Would love that with some afternoon chai. Looks so inviting! I wish this was here to have for dessert right now! Oh! These macaroons look delicious, especially topped with chocolate drizzle…I wish I could have one now. Yum! 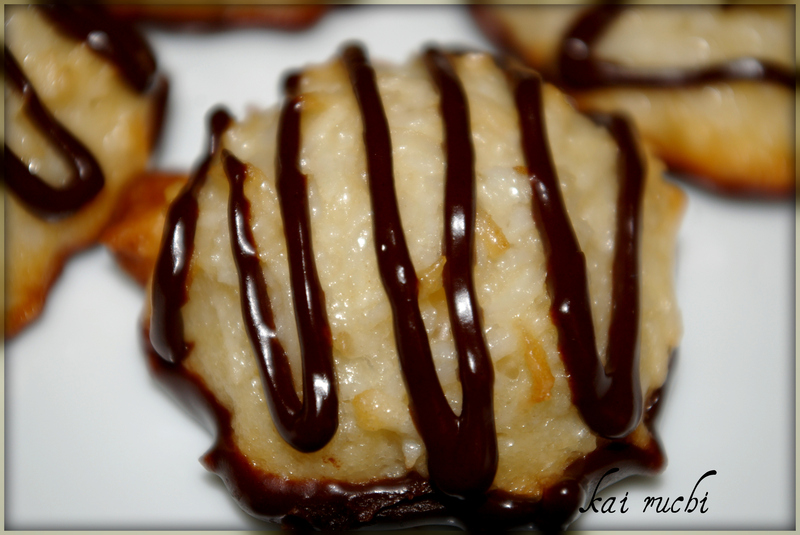 I love coconut macaroons…and dipped in chocolate make them even more delicious!! !